As Charlotte steps through the gate, she has a strong feeling that nothing will ever be the same again. Moving back to South Carolina after three years away, Charlotte knows she's going to have to face people from her past and adjust to a new high school, but she's completely unprepared for what else waits for her in Charleston. Drawn through an old garden gate, Charlotte discovers a hidden world where she meets Calvin, a boy to whom she is inexplicably attracted. As Charlotte is pulled deeper into this hidden world, it's up to her older brother Kevin to rescue her. No matter how hard Kevin tries, the rescue depends upon Charlotte fighting her intense feelings for Calvin while mastering a set of abilities that she has only just discovered she possesses. Beckoning Light, was a journey filled book. A book that took me into a whole new world and let me live there with the characters. I love a book that creates a whole new world and is so detailed that you can see it in your head. That is exactly what Alyssa Rose Ivy does with Beckoning Light. I loved the characters of this amazing book. The wonderful author brings her characters to life for you with her words and those very words are the characters stepping stones to climb out of the pages and tell their story right before your eyes. I could really relate to the main character Charlotte in so many ways. She doesn't see herself very clearly and doesn't understand the attention she gets when she moves back. She has an overprotective brother that still sees her as a little girl. Plus she isn't very social till she comes back to South Carolina. I love this character, she has no idea just how strong she really is until she has to be. Another character I really loved was Liam. Liam is Charlotte's brothers best friend. A guy that Charlotte had a thing for. The thing is I got that Liam feels for Charlotte a whole lot more than he let on. I can't wait to read the next book to see if I'm right. Actually, I'm dying to read the next book for way more reasons. I want to know if Kevin ends up with the girl he wants and is falling for. I'm dying to know so much more but I can't reveal right now! I loved this story line of this book. The different world and the way to enter this different world caught my attention and wouldn't let go of it! While reading Beckoning Light, it was as if I stepped into that world with Charlotte. I love great books like this one! If you haven't read this book its a must. 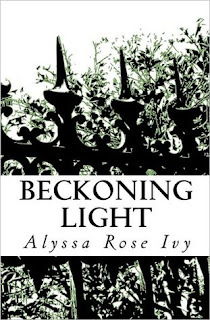 Beckoning Light is now on my Top 2011 books! Thanks so much Alyssa for letting me read your amazing book and for letting me enter through the gate with Charlotte! Can't wait to read more of their story! !